One of our initiatives at Games Precipice is to learn from established game designers and learn from their design decisions and thought process as their work gets published. This month game designer Scott Almes was generous enough to squeeze us into his very active schedule to discuss two current projects and our January monthly topic of balance in game design. Scott is known for his recent designs of Martian Dice and Kings of Air and Steam. Already in 2014, Tiny Epic Kingdoms which will be published by Gamelyn Games has reached incredible success on Kickstarter and there is still time to be a part of it until it ends on February 8th. Scott has ten games scheduled for publishing in 2014 so we will be excited to see what else he has in store for us this year. Games Precipice: Thank you for taking the time to join us, Scott. For those soon to be familiar with your current and upcoming games, who is Scott Almes? I’m a relatively new designer. My first games were Martian Dice and Kings of Air and Steam, both through Tasty Minstrel Games. Designing games, for me, is a part time job. By day I am a product engineer. When I get the time, I also enjoy writing short stories and have had a few published here and there. GP: I became familiar with your design work when Kings of Air and Steam caught my attention early last year. What inspired you to get started in game design? Board games were something I always enjoyed with my family and friends. There were many heated games of Christmas-time Monopoly. When I was young my friends and I would play Risk in a tent in the backyard until 2 in the morning. So, board games have been a part of my life for a long time. I tend to be a tinkerer in my free time, so I think making board games was inevitable. I like to read, so I started to write. I like to learn how things work, so I became an engineer. I like board games, and for me it was just the next step. I guess I just have that bug. Also, it helps that I know people that are very tolerant of playing games with hand drawn maps and poorly formatted cards. GP: Tiny Epic Kingdoms has stormed through stretch goals to more than 1000% of its goal while forming a passionate community. For those who haven’t seen it yet, how would you describe Tiny Epic Kingdoms? At the moment I’m writing this we just broke 5,000 backers… which is amazing! It had been a wild, amazing ride and we still have some days left. Tiny Epic Kingdoms is a 4X game – which stands for eXpand, eXploit, eXterminate, and eXplore. Commonly, these games are 4+ hour affairs and require an hour of rules reading and setup. TEK can be played in 30 minutes, and is very quick to learn. Plus, it’s pocket-sized! A normal 4X game comes in a box the size of your table. GP: Two of the recent trends in board gaming consist of 4x games and microgames. As the two are seemingly at different ends of a spectrum, where did the idea come from to combine the ideas? They are different ends of the spectrum, for sure, which is why TEK came to be. The microgame trend is big right now. However, most of the microgames that are coming out are very similar – they are bluffing games. Love Letter, Coup, Council of Verona: they are all games of bluff. I wanted to see a microgame to something different, something big. I thought, what’s the biggest type of game out there? 4X! What would it take to design a micro-4X game? With the challenge set, I designed Tiny Epic Kingdoms. GP: I’d imagine there are quite a few constraints to fit the criteria for both a 4x and a microgame; were there any ideas that unfortunately had to be left on the cutting room floor? Tons of ideas got left out in order to make it a microgame, but some may get back in from stretch goals. For example, the Exploration chips that come with our 200k stretch goal really ramp up the exploration ‘X’ in the game. It adds a bit of luck, but it’s not game changing. That’s just one example, of course. Whether it’s a microgame or not, there’s a lot of ideas left on the cutting room floor. Games need to be as streamlined as possible without losing the flavor that makes the game fun. For Martian Dice, there were bonus scoring cards we took out of the game because it complicated things too much. These are necessary, but difficult choices every designer has to make. GP: Did Tiny Epic Kingdoms have any influences from other games you have played or worked on in the past? With the action selection mechanic, there’s a big influence from the Puerto Rico and Glory to Rome mechanic. It’s been used in other games as well. One of my favorite other implementation was mixing it with deck building in Seth Jaffee’s Eminent Domain. It’s such a strong mechanism. TEK, though, is different than other games I’ve created. I normally don’t have combat in my games, so having a game with a war mechanic was new territory for me. My games tend to be in all different genres, so I like trying something new in every design. GP: Some potential benefits of a 4x microgame might be a smaller footprint and shortened playing time merged with a deeper gameplay than we have come to see from many microgames. Did you begin with any core concept that you kept all the way through the design process? A short play time and small footprint were my primary concepts going forward. Easy to learn was one as well, but that’s true for all my game. Even Kings of Air and Steam, which is a bit heavier, is pretty straight forward once you play a turn. The more time players spend looking up rules the less time they are having fun. GP: Our topic this month deals with balance in game design. In Tiny Epic Kingdoms players select among factions such as the Orcs and the Elves, each with different actions and opportunities to score. Are there any tips you can give up-and-coming designers on how to balance ideas similar to your factions? When it comes to balance, the best balancing agent a game has is the players. 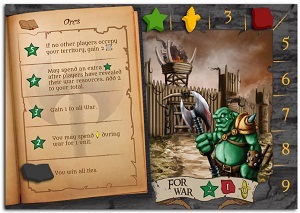 If somebody like the Orcs are strong in war, you want to allow the players to be able to balance that out. For instance, in TEK a player can have two cubes in a space in order to prevent a player from attacking. That is a way to counter their ability. And you need to pay attention to what your playtesters are saying. Sometimes, even if there is a balancing agent, it’s not a fun one to implement or too obscure for players to get in their first couple plays. You want the game to be fun right out of the gate. So, that’s my advice: for each strength of a character, faction, card, etc, make sure there’s a way for a player to prevent or predict it. GP: A popular motif in contemporary game design is a “catch-up” mechanic to prevent a runaway leader. The math behind expanding your territory in Tiny Epic Kingdoms looks like it ensures nobody builds too large a territory advantage. Are there any other “catch-up” mechanics in Tiny Epic Kingdoms, and do you think players not in the lead are able to work together to slow down the leader? There isn’t an official “catch up” mechanic in TEK that purposely slows people down or accelerates play for those falling behind. The action selection mechanic does ensure that players have actions and resources available to them constantly. So, all players will have the same opportunity. Also, since there is multiple paths to victory, a player that is suffering in one aspect (say, Magic) is likely doing well in another (like the Tower). GP: You’ve had an incredible run of success recently; what can we look forward to besides playing Tiny Epic Kingdoms in 2014 and beyond? The next game out of the gate for me will be “Bigfoot”, which is a 2 player asymmetric deduction game published by Game Salute. “Of Mice and Lemmings”, a trick taking game with hidden roles, is right around the corner with Sprocket Games. And, a micro-euro called “Harbour” will be coming out with my good friends at Tasty Minstrel Games in the second quarter of 2014 as well. All of these games will be coming to Kickstarter, and there will be more later on in the year. 2014 is going to be a very busy year, and 2015 is starting to stack up as well. GP: Tell us about Bigfoot. What inspired the use of the theme? In “Bigfoot”, one player plays bigfoot and the other player is a cryptozoologist. The goal of bigfoot is to hide for 6 rounds, while the cryptozoologist wins by finding him before time runs out. I’ve been trying to come up with a good deduction game for a while, and the bigfoot theme just fell into place. Bigfoot uses several types of asymmetry to make the role of Bigfoot very distinct from the Cryptozoologist. The diversity of the two roles really fits the narrative of a theorist pursuing his subject matter. One of the areas I am most excited about in Bigfoot is the use of the “I divide, you choose” mechanic. How did the development process lead to the dissimilarities between the roles and how did you decide on using this mechanic? The asymmetry came through very organically. I knew that bigfoot and the cryptozoologist would have separate goals, and then led to different actions, etc. The game uses a ‘split’ mechanic that’s been dreadfully underutilized, but appears in games like Canal Grande, San Marco, and Piece of Cake. The cryptozoologist splits a hand of cards into two ‘paths’, and then bigfoot selects which path he takes. There are traps that give the cryptozoologist information, and action cards that either player can use. Both decisions – splitting the path or selecting – are very difficult, but unique. I’ve been waiting to use this mechanic for a while, and it just took me a long time to find the right game for it. I decided I wanted to design a two player game, and was thinking about a deduction game. Everything just clicked into place. It goes to show, always right down an idea, you never know when you might end up using it. In Tiny Epic Kingdoms, what faction did you most enjoy designing? The fan faction, the Shapeshifters, was a really fun one. They have the ability to shift into other factions, so playing them is like taking a tour of the entire game. In Bigfoot, if you could only play as either Bigfoot or the Cryptozoologist for the next month which would it be? What popular board game are you most embarrassed to say you have NOT played? I’ve never played “Caylus” or “Stone Age”. But, neither have appealed to me that much. The one I’m embarrassed not to have played is “Tichu”, because I love trick taking and climbing games, and I think I would love it. TC Petty’s ‘forced team’ mechanic in “VivaJava” is my favorite recent mechanic. It’s just amazing. I’ll hate him forever because he came up with that before me, no matter how nice of a guy he is in real life. Biggest tip for starting: Just start designing games. There is no formula. Design games that get you excited and you care about, and go from there. And, never hinge everything on just one design. After you start, keep designing. Biggest tip on your game: Cut out 30% of your mechanics and reduce the amount of luck in your game. Biggest tip on finding a publisher: Be kind and professional and don’t act like a fan boy. They’ll already assume you like games, but what they are going to want to know is that you will act professional and know what goes into publishing a game. Be polite, even if the publisher isn’t. If they reject your game, ask for feedback and listen. You don’t have to incorporate all the changes, but you should listen. I can’t express how appreciative we are that Scott was willing to take the time to join us and discuss game design. At the time of this writing Tiny Epic Kingdoms by Gamelyn Games is on Kickstarter with more more than a week to go. Bigfoot is being published through Game Salute in early February. We look forward to seeing what Scott has coming out in 2014 and beyond.